Pool games are a fun way for people of all ages to cool off in the summer heat. Have a mix of both competitive and non-competitive games. Games are all about having fun, so keep them light and appropriate for whatever age level will be participating. There are plenty of games that are appropriate for the pool and can add hours of entertainment to any pool party. 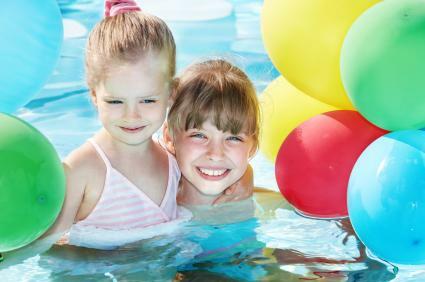 For those who are planning a party for younger children, keep in mind that many kids just enjoy splashing around in the pool, without an organized game. Let their imaginations go crazy and they will come up with plenty of party game ideas on their own. Just be sure to supervise like you would if they were playing a traditional game. The following games may need to be modified depending upon the ages of the players, and some of them may only be suitable for older players who are good swimmers. If you have a pool full of little ones, be sure to select games that can be played in the shallow end of the pool. Have kids stand in a circle in the water. This game is played similar to "duck, duck, goose," but in the water. Have one person be the one who goes around the circle and tap each kid on the shoulder and say "fish." Once they tap someone and say "whale," that person becomes "it." Line up the kids in the water near the edge of the pool. Have them grab onto the side of the pool and then let their legs come up behind them. Whoever can kick the longest is the winner. Play this game in a similar manner to playing it on the playground. Two children stand in the water with their hands locked above their head. The other children go through the bridge as they sing the song. Those trapped in the bridge when it "falls" becomes the next set of kids to be the bridge. The classic game of Marco Polo is one of the most well known swimming pool games and is perfect for kid, adult and teen pool parties. One person is "it" and blindfolded. He or she then calls out "Marco" to which the other people in the pool reply "Polo." Based on the replies, the person needs to seek out and tag other people in the pool, who then becomes "it." Little kids will love playing this game in the pool. Before the party, fill a piñata with water-themed toys, like deflated beach balls, squirt guns, dive sticks, goggles, sunglasses and toy boats. You will then need to secure the piñata over the pool by either attaching it to a long pole (the pole that attaches to the pool vacuum works great) or stringing it up over the pool. Kids can take turns trying to hit the piñata. Once it bursts, kids can grab the toys. Be sure every child gets at least one toy. You'll need enough pool noodles so that each player has his or her own. Have kids sit on their noodles as if they are riding a seahorse. Line each player up across the pool. Instruct the kids that on a given signal, they are to race across the pool on their "seahorses." Remind them that if they fall off their seahorse, they have to go back to the beginning and start over. The first player to reach the other end of the pool wins. This classic game can be played in a pool. Crank up the radio with your favorite summer-time tunes, and use a beach ball as the potato. Begin by passing around the beach ball. Once the music stops, whoever is holding the beach ball is out. Divide kids into teams of two. Each person throws a water balloon to the other. The team that can toss the water balloon longest without it breaking is the winner. Teams can challenge themselves by moving further away with each round. Throw objects in the pool and the team that finds the most is the winner. A variation on this is diving for rings or sticks in the pool. Water tag using a ball or sponge to tag the person as "it"
When you plan games for a pool party, it is good to keep safety in mind. 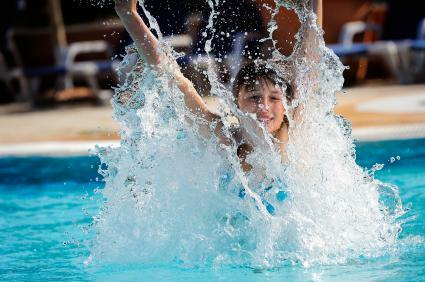 Games for children should not be aggressive, because swimming skills amongst the kids widely vary. The more aggressive a game is, the more likely someone will get hurt. Adults should always supervise a pool party.